Price is based on double or twin hotel room occupancy and includes accommodation, transfers, car/driver, English-speaking guide, activities and entrance fees, breakfasts and some casual lunches while touring. Flights and optional special activities will be quoted separately. Most personal expenses, including dinners, alcoholic beverages, spa treatments and gratuities can be paid on the spot while traveling. 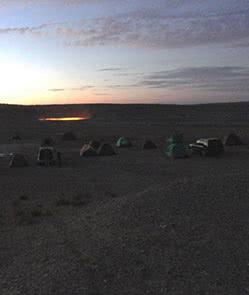 Set up camp in the desert village of Darvaza, close to a flaming crater caused by natural hot gasses. 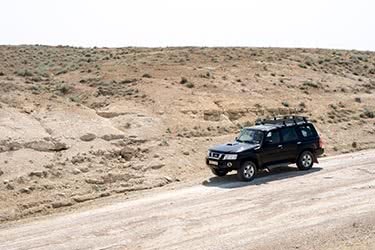 Drive deep into the Karakum desert, discovering sweeping sand dunes and plains of dusty, hard takyrs. Explore the archaeological park of Ancient Merv, and discover relics from ancient to post-medieval times. 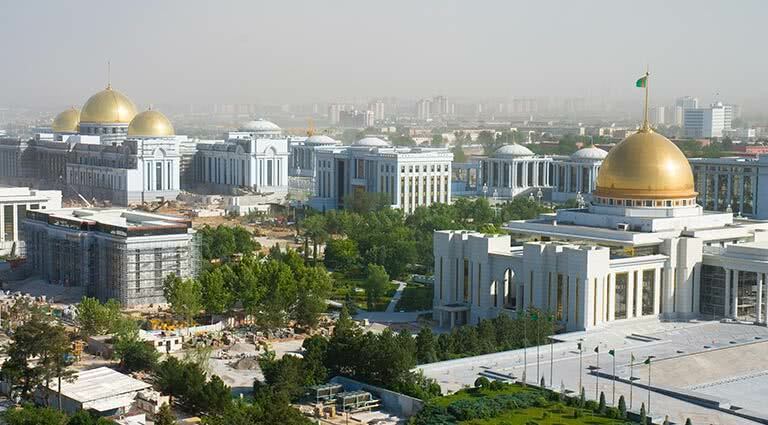 Sight-see in the glamorous city of Ashgabat, visiting the Park of Independence and the Arch of Neutrality. From the moment you cross over the border from Uzbekistan, your tour in Turkmenistan is full of adventure, excitement and wonder. In just nine days, you’ll explore several UNESCO World Heritage Sites, set up camp in the heart of the desert by a molten lava crater, discover medieval villages amid modern towns and spend time in the white-marbled city of Ashgabat, the capital and largest city in the country - all while following traditional routes through the desert or along the old Silk Road. 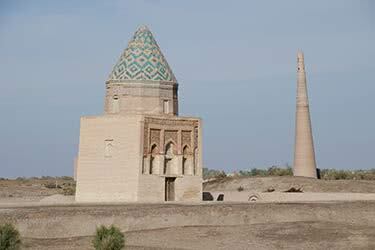 Discover history, discover culture, discover Turkmenistan. 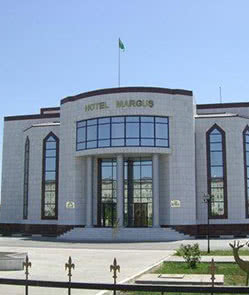 Begin your adventure through Turkmenistan at the Uzbekistan border. After meeting your guide, go through customs and drive to the border town of Dashoguz, the capital of the northern region of Turkmenistan, to check into your hotel and stay overnight. Today you’re off and away, as you enjoy breakfast and then head northwest toward Kunya-Urgench, a UNESCO World Heritage Site and the medieval capital of the Muslim Khorezmshah Empire. Explore the monuments, mosques and mausoleums of this glorious city, then take off south on the traditional route across the Karakum desert to the desert village of Darvaza. Here, your drivers will set up camp for the night as you tour the nearby flaming crater, an incredible molten lava cavity caused by natural hot gasses in the ground. After exploring the vast circumference of this crater, head back to camp for a dinner of delicious nomadic food and an overnight stay in your tent. After breakfast, it’s time to pack up camp and head east towards the heart of the Karakum desert, the village of Damla. Head over high sand dunes and across plains of dusty, hard-packed clay - a natural phenomenon called “takyrs” - for an incredible three-hour drive deep into the desert where Damla sits. Spend the rest of the day exploring this traditional rural village, home to cattle, sheep, goats and camels, before staying overnight in a national house. After a farewell to Damla over breakfast, you’ll set off through the desert once again, this time toward Ashgabat, the capital city of Turkmenistan and a soon-to-be gem of Central Asia known for its impressive white marble buildings. On the way, make a short stop at Yerbent, a metropolis – so to speak – within the desert, where you can see traditional houses set against satellite dishes and modern, urban living. 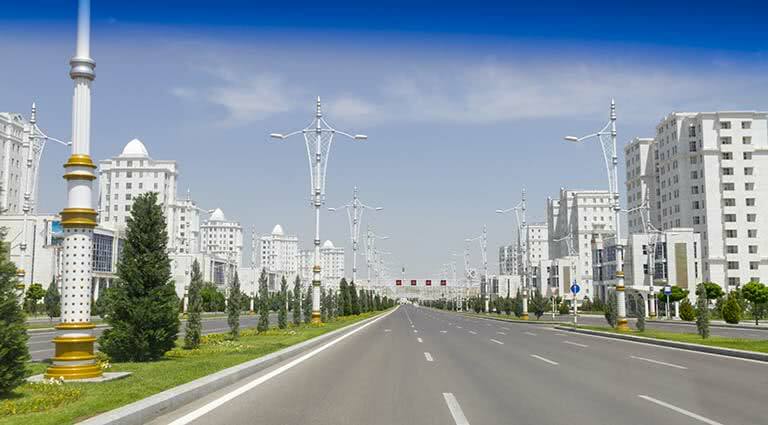 You’ll arrive in Ashgabat in the late afternoon, just in time to settle into your hotel and spend the evening exploring. 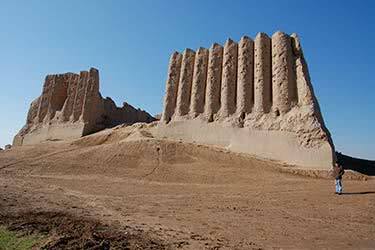 This morning, you’re heading east along one of the former Silk Road routes, stopping to visit the former medieval city of Bagabad, home of a Timurid-period citadel and the ruins of the famous Seyit Jemaleddin mosque. 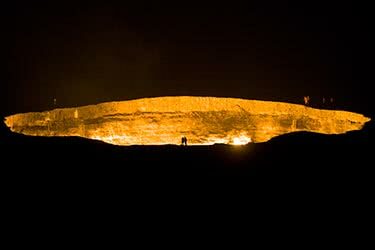 Afterward, you’ll continue to Mary, a city in the Karakum desert and a famous archaeological site. Here, you’ll have some time to explore the city before staying overnight. Continue to explore the incredible history of Turkmenistan, as today you take off northeast from Mary towards Gonur Depe, the former capital of the Margust country. Gaze out at unique fields and villages as you drive through the desert, arriving at the former city and archaeological site, the center of a remarkable Bronze Age civilization. Discover some of the city’s hidden treasures before enjoying a picnic lunch, then head back to Mary in the afternoon to check out the local history museum and some more of the city’s great sites. 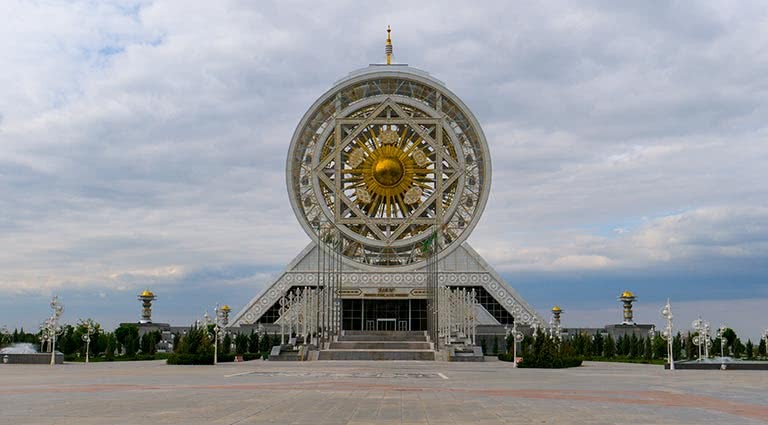 Today it’s back to the capital city of Ashgabat - but not before exploring the incredible UNESCO World Heritage Site and archaeological park of Ancient Merv, a reconstructed version of the once-major stop on the Silk Road, portraying time periods from ancient to post-medieval. 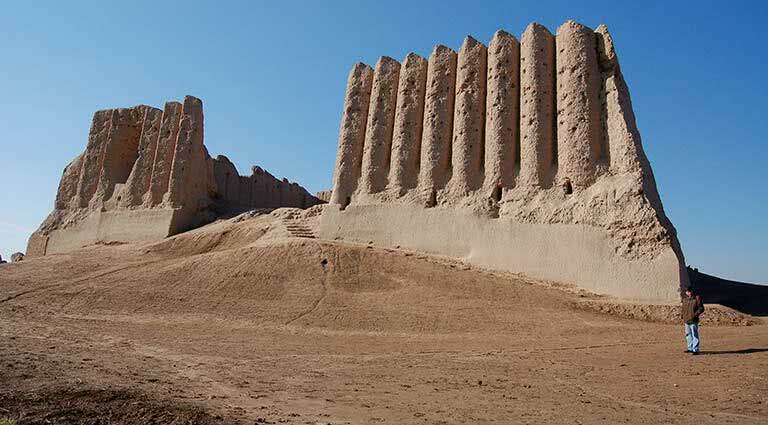 After learning more about the history of this significant location, explore the ruins of Abiverd, once an important trading town in northern Khorasan. 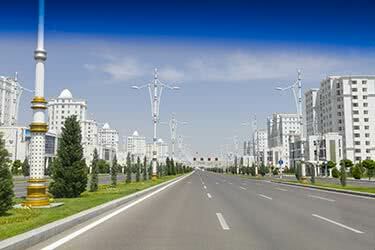 After sightseeing, set off back to Ashgabat for your overnight stay. 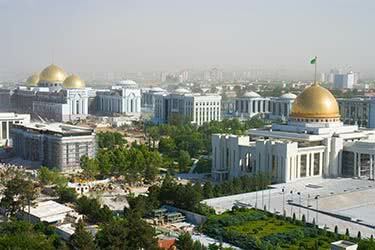 Spend the day exploring some of the most significant sites in and around Ashgabat. First, head to the nearby fortress of Old Nisa, the first capital of the Parthian Empire, located on an irregular pentagon hill at the foot of the Kopet-Dag Mountains. 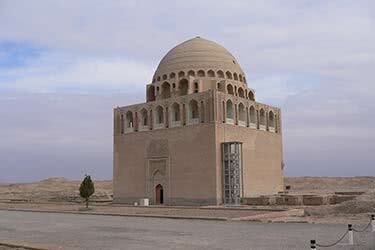 Then, head to Kipchak village to visit the biggest mosque in the country and the family mausoleum of the first president. 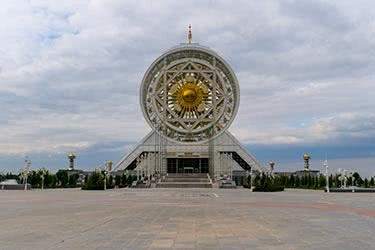 Finally, wrap up the day sightseeing within Ashgabat itself, checking out sites including the incredible white marble statue in the Park of Independence and the Arch of Neutrality, a revolving statue with the first president on top. 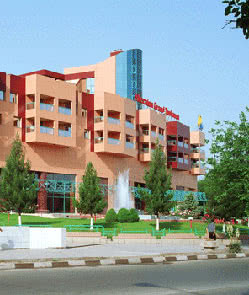 You will stay overnight once again in Ashgabat. This morning, you depart early in the morning with a transfer to the airport for your flight back home or on to your next exciting destination, putting a close to your incredible adventure tour. 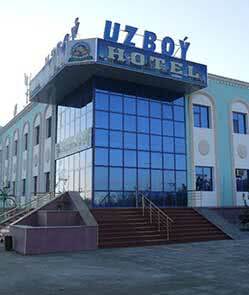 Renovated in 2009, the two-star Uzboy Hotel is a basic yet convenient stop-off for tourists travelling through the Dashoguz region of Turkmenistan. Some of the most important historical monuments in the country are located nearby, such as the architecturally-impressive Kunya-Urgench, Butentau and scattered ruins of ancient settlements. Uzboy hotel offers a range of comfortable guestrooms, with basic amenities included such as en-suite bathrooms, furniture and air conditioning/heating. Elsewhere, guests can enjoy Uzboy’s on-site bar and restaurant and shop that sells local souvenirs and crafts. There is also an indoor swimming pool and a beauty salon open for all guests. There is Wi-Fi available throughout the hotel at a small extra cost. With only 350 inhabitants and not a hotel in sight, the only way to stay in the tiny Turkmen village of Darvaza is to camp, spending the night under the stars in a tent and sleeping bag. 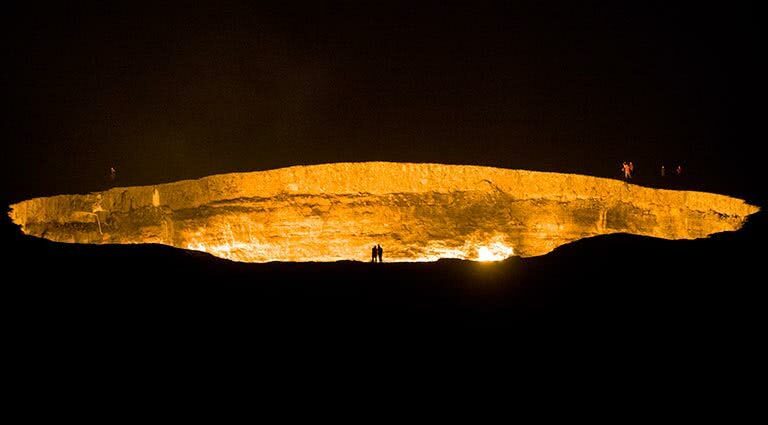 Located in the middle of the Karakum Desert, this tiny settlement is famous for its ‘Door to Hell’, a natural field of gas that has burnt bright ever since it was lit by Soviet petroleum engineers in 1971. 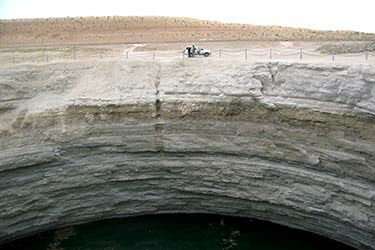 The crater is situated close to the village of Darvaza where you’ll be staying and has a diameter of 230 feet and drops about 70 feet into the earth below. Due to the incredible isolation of this attraction, as well as the nearby village, the best and only way to spend the night here is in tents. You will be supplied your own and helped to set up the campsite, as well as given a soft mattress and sleeping bag to ensure a comfortable - as well as memorable - stay. 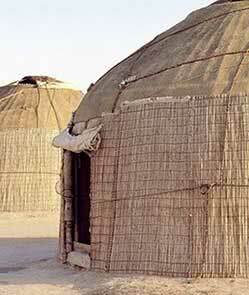 Damla is a tiny, isolated village located deep into Turkmenistan’s vast Karakum Desert. With only around 60 houses and sparse amenities available, the only way of staying in this remote region is by pitching up your own roof for the night – in the form of a traditional yurt. These portable, tipi-like structures can be put up in a matter of hours, and are comprised of a metal or wooden frame covered in fabric to keep the weather out, such as leather, sheep’s wool or felt. Yurts have been a prominent feature of Central Asian life for thousands of years, and this is your chance to experience in night’s sleep in one yourself. Your Damla village stay will be made all the more memorable as you watch the stunning sun set over the desert, then wake up the next morning as it creeps over the eastern horizon to start a new day. 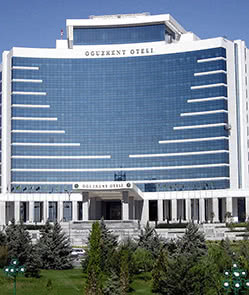 The five-star Grand Turkmen Hotel is one of the most luxurious and famous hotels in Turkmenistan’s capital, Ashgabat, and is located right in the heart of this bustling city. Rooms here come with all the facilities you’d expect with any five-star hotel, and guests can also enjoy the added convenience of having on-site cooking facilities, various dining options, an elegant swimming pool and a fitness suite, massage and sauna room. From the comfort of the hotel, some of the city’s standout attractions, including Independence Monument and the National Museum, are just a short walk or drive away, and the immediate area is full of lively restaurants, bars and cafes. The Grand Turkmen Hotel also caters for a wide range of tastes at its large all-day restaurant which serves up Asian, European and international flavours. There’s also an on-site casino and disco for some entertainment after the sun goes down over Ashgabat. This modern five-star hotel in Ashgabat boasts an impressive 229 rooms and is located within a half-mile radius of the city’s major local attractions including the Parliament of Country and range of museums and theaters. It combines local fashions of marble and magnificent fountains with the first-class service for which this French hotel chain is renowned. Constructed in 2010 by the Bouygues Construction Company to offer luxury accommodation, this hotel does not fail to deliver. All suites are well-appointed and boast rain showers and TVs in the bath. With three swimming pools, a tennis court, spa, nightclub and bar, the Sofitel provides a full five-star experience of Tajikistan. This three-star hotel is one of the most popular places to stay in the oasis city of Mary, which is situated in the Karakum Desert, on the Murghab River. Close to the ancient and famous ‘Murgab’ site, Margush Hotel offers 28 spacious guestrooms, all of which are relatively modern with this hotel only having opened in 2004. What really makes this hotel special is its interior design, such as the impressive white marble at the entrance and pastel tones featured throughout the rooms giving reference to the surrounding desert terrain of Turkmenistan. The hotel also boasts an excellent swimming pool, an all day restaurant serving local and international food, as well as a bar and fitness center. 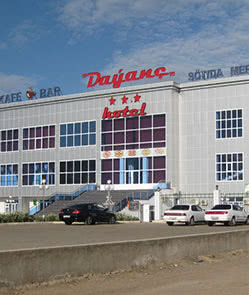 Recently opened in 2011, the comfortable and modern Dayanch Hotel is easily accessed by car from the airport in Mary, Turkmenistan. The rooms sleep two, four, and eight people and all come with private bathrooms and the usual mod-cons. If guests have time to kill, there are enough activities at the Dayanch Hotel to keep everyone occupied for the day, with a sauna, bar, restaurant, and a cute little cafe with tables set inside colorful yurts (traditional tents). The hotel is located in the rural area of Sakarchaga and guests can find plenty of amenities such as local cafes and bars in the nearby area. There’s also several nearby households willing to open their doors for visitors to take a peek into their live craft workshops. This seven-day tour is your chance to uncover Turkmenistan, a true hidden gem and one of the most mysterious regions of Central Asia. 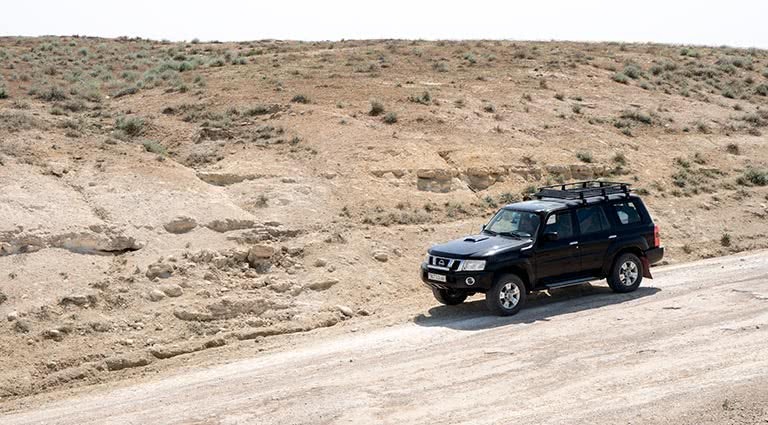 From off-road passes through the Karakum desert, to full-day excursions in ancient UNESCO sites, this guarantees to be one week of travelling like no other. This short and sweet four-day tour of Turkmenistan takes you to all the must-see sites in what is one of the most mysterious countries in Central Asia. After sightseeing in the capital, Ashgabat, make your way to the stunning ancient at Kunya-Urgench and Mary, both recognized as UNESCO World Heritage Sites. Turn back time on this two-week tour of two amazing countries. 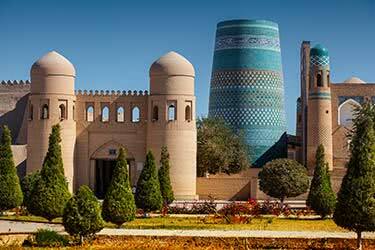 Explore historical wonders of Tashkent and Khiva and uncover the crumbling cities of Merv and Mary and the fortress of Nissa. 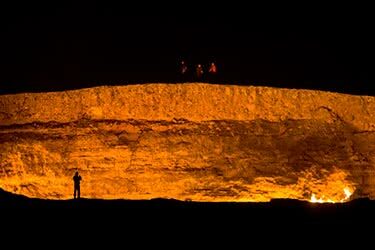 Camp by burning gas craters, get up close to the famous Akhal Teke horses of Turkmenistan and discover the palaces and mausoleums of mighty Emirs. The Yangykala Canyons, situated seven hours away from Ashgabat, are amongst the most spectacular of sights - not just in Turkmenistan - but in the whole of Central Asia. This three-day excursion is your chance to see the isolated, atmospheric, and deep flame-colored canyons in all their glory. Get to grips with the fascinating Turkmenistan capital, Ashgabat, over three action-packed days, before embarking on an epic overland journey. 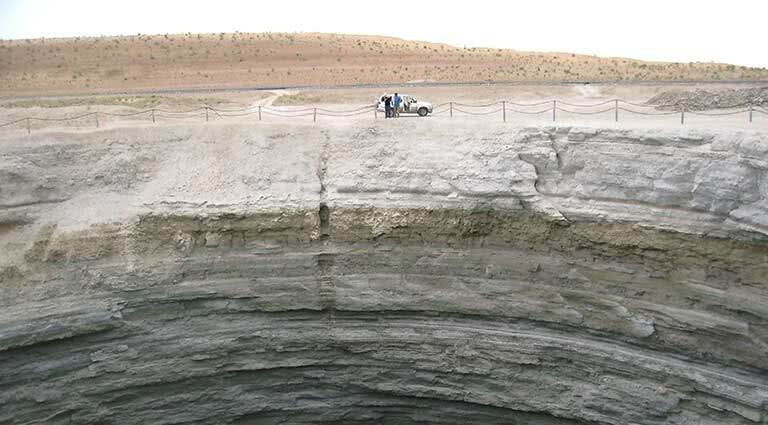 Your guide will take you to the World Heritage Site of Merv and Mary before you make your way back to the capital via the quaint local village of Bokurdak. This tour around the mysterious Central Asian country of Turkmenistan offers you the best of what this fascinating country has to offer: glistening mausoleums, ancient fortress remains, desolate deserts and majestic mountains, all wrapped up into an unforgettable eight-day adventure. 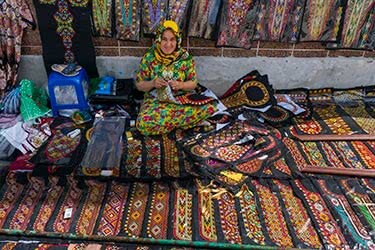 Take a quick dip into the history and culture of exciting Turkmenistan with this four-day, three-night adventure. In this short amount of time, you’ll visit three UNESCO World Heritage Sites, numerous mausoleums, countless forts and monuments and learn more about this fascinating Central Asian country. This eight-day tour of Turkmenistan opens up one of Central Asia’s most mysterious lands: Turkmenistan. 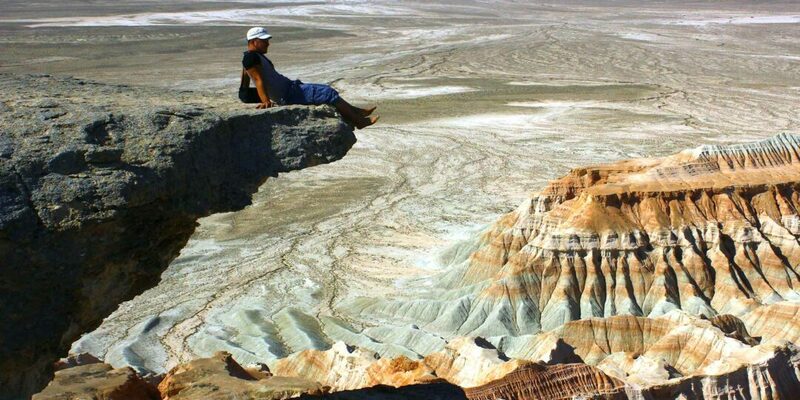 Passing over the desolate, yet utterly spectacular Karakum Desert, you’ll explore ancient ruins, dazzling mausoleums, and fiery caves, all before ending up in the fascinating capital of Ashgabat. 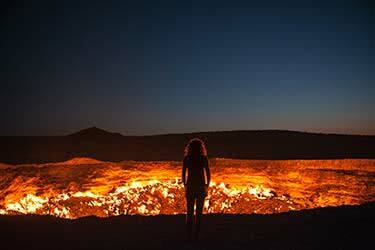 Our co-founder Jay Tindall loved being one of the few western tourists to visit Turkmenistan, and will never forget coming face-to-face with the Door to Hell at Darvaza! 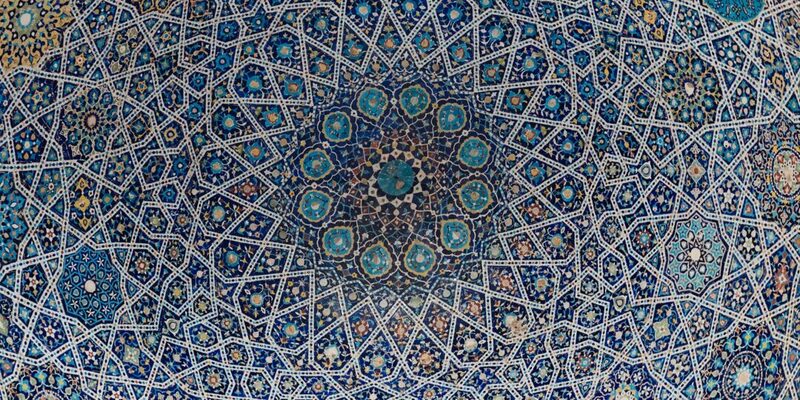 It would be impossible to take in all the history, depth, and curiosities of Turkmenistan in just three days. Still, worth a shot. 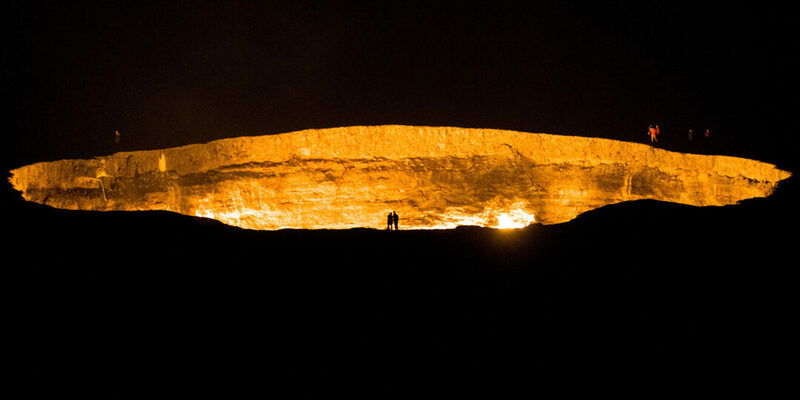 Jay Tindall takes his camera to the Turkmenistan desert for a look into the famed Darvaza gas crater, otherwise known as the Door to Hell, in the dead of night. Hidden in the yawning expanse of Central Asia that makes up the Stans are some treasures that should be on every intrepid traveler's map. 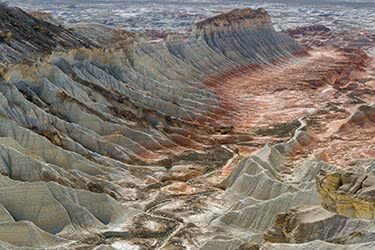 These seemingly uncharted lands are full of truly mind-blowing ancient and natural wonders.